A book about pies, perhaps? Absolutely. Quite an easy guess. 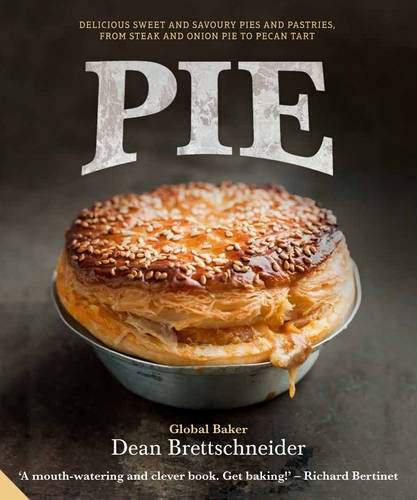 It’s written by Global Baker Dean Brettschneider. I think that just means that Dean’s from New Zealand. He’s got some pedigree, though, and has lived and worked in places as diverse as China and Denmark. Maybe so, but this book is very good indeed. It focuses entirely on things with a crust, and really, at this time of year, what’s not to like? Few people do, but there’s plenty of guidance here about getting the basics right. It takes time and some amount of practice to properly nail making good pastry, but it’s well worth the effort. As Brettshneider points out, pastry freezes remarkably well, and defrosts remarkably quickly, so there’s no reason not to make double or triple quantities and freeze some for use later. I often do this with pastry cases – one gets used for a tart or whatever, the other goes in the freezer, in its tin, and I just bake it blind from frozen when it’s needed. It’s a fantastic shortcut, and baking blind from frozen rarely fails, sidestepping the faff of baking beans. Brettschneider tackles the unasked question head on, as well, and yes, using store-bought pastry is OK, but making it yourself is all part of the fun. It’s true that commercial pastry is often pretty good, but you’re paying for convenience, and it just isn’t the same as pastry you make yourself. Trust me, it isn’t. just go forth and make pastry. Right then. What about the rest of the book? I tend to divide cookery books into three buckets – ones that are just beautiful things to own and read, but are largely useless for actual cooking, ones that are supremely practical and useful, and ones that are just a bit ‘meh’. This one falls firmly into the middle category. There’s plenty to actually cook here, recipe after recipe of pastry-encased goodness, ranging from classic beef Wellingtons and Melton Mowbray-style pork pies right through to a sweet and spicy pork, veal and macadamia nut tart. Goodness only knows what that actually tastes like, but I’m game for anything once. Brettschneider stretches the definition of a pie to include a range of tarts, rolls and pasties, including a couple of empanadas. Brettschneider’s tarte tatin looks superb. So, worth a quick look? Most certainly. Everybody loves a good pie. Why not be just a little more adventurous? This book covers everything you need to know to start making a huge range of pies quickly and easily. It’s well-presented, clearly written with excellent guidance on the ins and outs of pie making, and there are plenty of good ideas on what to actually put in your pie.